Saul Marquez: Welcome back to the podcast. Today I have the excellent Keith Boone. Informatics Adept at Audacious Inquiry, LLC. Keith has two decades of standards development and implementation and more than a decade of standards leadership experience. He represents Ai to Health Level 7, Integrating the Healthcare Enterprise and diverse other bodies developing health IT standards and implementation guidelines. 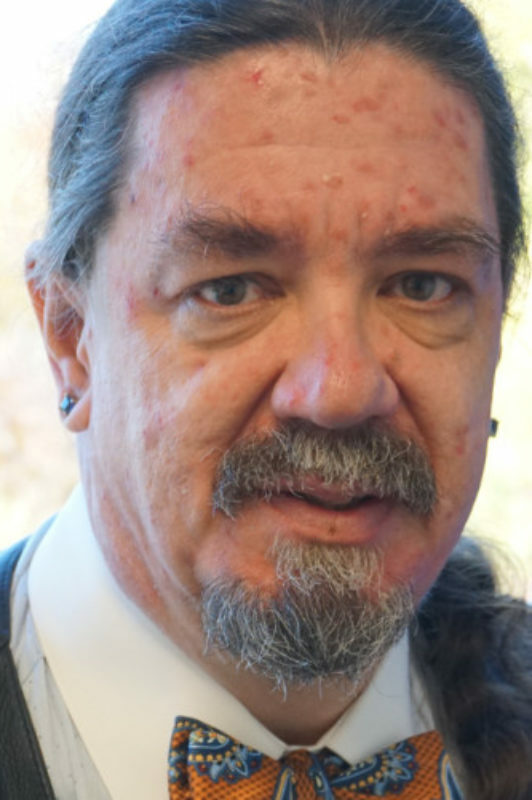 He brings his experience in natural language processing, information retrieval, machine learning, XML and health IT standards to augment Ai’s product offerings, and in standards development and training to assist regional, state, and national initiatives and raising the bar for Health Information Exchange. We hit a lot of hot buttons and buzzwords in Keith’s intro and it really is no short of really what he does and what he’s an expert at. So you’ve struggled or have been looking to make an impact in this area. Stay tuned because we’re gonna be having some really great discussions. So Keith, thanks for joining me today. Keith Boone: Thanks for having me on. Appreciate being with you. Saul Marquez: Absolutely. So, you could have done a lot right. I mean you’re a whiz at Ai and all of the future talk, that’s your present but you decided healthcare out of all industries, why? Keith Boone: So I originally got started in this as know I’m a software developer, I write computer code. Keith Boone: And I had 20 years of experience in software before it ever even touched healthcare. So I spent about a decade natural language processing software for a company that built spelling, grammar, other NLP tools for a lot of large software vendors including Microsoft so I’ve had code that’s used by not just millions but hundreds of millions I think I looked up today. Microsoft Office is used by 1.2 billion people and the spelling correction in there still has lines of code I wrote. Saul Marquez: Nice. That’s pretty cool by the way. Keith Boone: It is, it is cool. So in about 2001, I joined Dictaphone, which is now Nuance and I began on not working in natural language processing software for healthcare. And they quickly got me engaged in healthcare standards because previously I had been working with XML standards and been involved in some of the W3C (World Wide Web Consortium) work on XML standards and so they got me engaged there. And I quickly realized how what I was doing in the healthcare standards space could not only affect the lives of hundreds of millions of people but also like not just like put a red underline under a misspelled word in your resumé but maybe save a life. And I realized there I was ever going back to Pure Software Development. What had been a profession now was just became a calling. What I do today is so much more important than making sure that somebody whose resume is letter perfect. Saul Marquez: And super cool transition and how it happened. Now you’re impacting the lives rather than just words on paper. But you know what, in healthcare we’ve got data, we’ve got documents, we’ve got a lot of things that need scale, and that’s something that you’ve been able to do effectively. Maybe you could talk to us about what you believe needs to be on the minds of healthcare leaders today as it relates to software and the standards that you’re used to developing. Keith Boone: So part of what’s happening right now around scaling is moving away from a document oriented focus into having a much more granular focus. So through API’s for access to healthcare data especially something called Fast Health Information Resources HL7. So these days every EHR that you get has access to clinical documents. That’s part of the certification program that our federal governments put together. But now you also through those same products can as a patient use mobile or web-based applications or where the products have the capability to let patients use mobile or web based application to get access to the health care data. Now the challenge is that this actually needs to be set up in healthcare practices. So there is this Office of the National Coordinator or ONC for short, that’s an agency that reports to Secretary of Health and Human Services. They recently did a report on how many of these EHR systems actually support API’s or have certified product out there that has an API capability. So 80% of the hospitals today across the country and where I live 100% and about two thirds of non hospital physicians have these API’s like built in already so my doctor’s office has this capability for both the specialists that I go see as well as my personal physician. And so one of the challenges we have now and what I think is really important for medical leaders is focusing on trying to get those access to those API’s in patient hands and not just it’s in the EHR but it’s actually being used through these standards. So in my particular space what we’re doing with this is to try to lead the efforts in the standards organization. So one of the first things I did when I joined AI. which I’ve only been here a month was the organization joint of Level 7 and integrating the health care enterprise so that we could continue to lead in these efforts and make it easier for health care providers to take advantage of the API and then use them not only with their current systems that have the capabilities but also to support the legacy interfaces that some of the older systems that they’re stopping to work with are still using. And then also look at how to move this right into the bleeding edge of precision medicine where this is now also enabling patients to have access to the data and then they get turnaround and share it with others in a program called Sync for Science with medical researchers so that researchers can now use the data to do precision medicine. So that’s from my perspective focusing on how your organization is rolling out and using these API is to provide better care for patients. I think one of the most important things that is top of my mind. Saul Marquez: For sure. So it’s about interoperability? Keith Boone: So this the API is enable information to be exchanged from say the hospital I might go to and my own personal physician for example. And so you know as soon as I show up in the hospital they can see that oh all he’s been admitted to a hospital. It doesn’t just happen automatically that you’re right. There’s got to be some data that gets transmitted in both systems at either end and have to be able to understand it. Saul Marquez: Yep absolutely. And so the thing that is sort of from my knowledge and maybe we can take advantage of your expertise here today Keith, what seems to be becoming the standard is fire the fire API. Keith Boone: You’ve got it. Saul Marquez: You talk to us a little bit more about that for the folks listening that aren’t highly technical. Why is this important and how can they approach it, if they’re on the provider side or even on the industry side? Keith Boone: So we’ve had standards for for decades that allow us to exchange data between these systems. When we started those standards fit into a several hundred page book and we’ve now gotten to the point now where a single implementation guide can be several hundred pages or even big so it becomes really really challenging for developers to work with this data at every implementation guide is built on a different foundation. So what fire does is it goes back to the basics and says “okay there’s 50, maybe a hundred, maybe more, different kinds of data that you have to work with,” things like problems, things like allergies, things like medication, things like lab results et cetera. Let’s look at each one of these individually and come up with a way to represent that’s going to be easy for the software developer to understand and use with today’s modern technology. Let’s not focus on stuff that was written for 80 column punch card format but focus on the web, web-based, restful services. So basically the same stuff that you use today when you’re looking at the Web the computer uses to get access to the information. And so these are the resources so fast health care information resources or interoperability resources. That’s the resource component. So we now have a way to represent a medication that can be used for reporting on clinical information. It can be used to deal with medical claims. It can be used in an electronic prescription. It could be used for other not strictly healthcare related things but things that are closely associated like getting a disability determination. And so we started out by doing this with the HL7 clinical document architecture and pieces of the document became very standardized. But you still have a whole document, there’s still a lot of data and you couldn’t get to the grades that you needed. But it does is it makes those grains of data accessible. Saul Marquez: Interesting. So is HL7 part of the fire framework? Keith Boone: So Health Level 7 is two things; (1) it’s an organization that creates healthcare standards, (2) it’s the name by which it’s most commonly implemented standard HL7 version 2 is known as the HL7 built fire created fire.Iit was actually originated from by a fellow by the name of Graham Greve who has been working on it for oh I don’t know So it’s probably around 2011. So for about seven years or so a long time. It’s new to us because it’s actually gotten to a level where it’s pervasive and physicians are so much more aware of standards now because meaningful use they had to become aware of standards. Saul Marquez: For sure. Now that’s really fascinating a cool information here. As we we peel back the layer on terms that we are here but do we really understand them. So Keith is given us a good one to one less than here on where did these things come from and how are they useful. So as you do your work in this space Keith, what would you say one of the setbacks that you’ve had or maybe even the industry has had and what we learned from it? Keith Boone: So when I first got into this field, the company I worked with was trying to develop automated coding and data mining tools for health care documents. The way that we communicate today through documents sort of like the comprehend medical technology Amazon just recently got their big press release around. So we built this system, it was able to go through and identify problems, meds, allergies, procedures, other sorts of stuff. And we even did a study of the accuracy. We reached a point where we could pull this information out of these documents as accurately as a human who was coding this stuff for claims. So the challenge was we couldn’t explain how this system had come to a conclusion about what codes to use. So you couldn’t argue for itself. So even though we built a system that could do effectively the same job much more efficiently, it was missing some critical components and it couldn’t learn from it’s mistakes. So now I understand this was also about 15 years ago. So it was way ahead of its time and at Baghdad nobody would believe that a computer could do jobs like this. Now you have Amazon, you have IBM, you have all these others having demonstrated. So it’s much more believable technology. But when you’re building these systems or the computers doing so much work that used to be done by a human, it has to be able to sort of explain how these conclusions were reached and how we got to this particular statement that’s showing up on the screen. Otherwise it’s not going to be believable. Somebody who’s looking at it isn’t going to understand how it got there might have come to a different conclusion. And you also have to then be able to have that information be fit back in so that goes in to sort of the next round of decisions that the computer wants to make it. Saul Marquez: That’s interesting because while you could develop something that the output is what you want, you still have to be able to have believability and an understanding of how it got there. If you can’t put that together then really it doesn’t work. Keith Boone: Well I’m going to put it more simply and in terms that I’m sure your listeners will understand. If you can’t take the outcomes that occurred and feed them back into the process, the process will never improve. Saul Marquez: Make sense. Fascinating. So now you, the time has come where where there are more more companies and systems doing this type of work. What would you say one of your proudest experiences has been to date with the work you’re doing? Saul Marquez: Its really cool man. Keith Boone: No, we had two versions of that standard at the same time. The old version and the new one. And so back in like 2015 when ONC was trying to update the standards, they ran into this challenge of wanting to have both of them working in the new certified systems at the same time. So this is something that a Gartner analyst Westerners called asynchronous backwards compatibility and they said “well the system is gonna have to do both at the same time” but that would have been a nightmare for every EHR vendor and also the users of those EHR and existence because there’d be a lot of burden and costs you’d be doing on producing the same document twice such as twice as much processing and not a whole lot of values to support backwards compatibility. Saul Marquez: That’s pretty fast. Keith Boone: Was hook our work into the process and improve the process and pave the way for others to advance standards in HL7 rapidly to meet the same kinds of needs. We had to do this in a 60-day comment period, right. So it needed to happen fast and we managed it and it got named in the new updated standard got named in the 2015 certification. Saul Marquez: Awesome. Now that is a… I love it man. It’s you know I have an appreciation when you’re not spending the time in front of the code and thinking about it from the perspective of a physician or a clinician managing their EMR, how it all happens and why and you know the stories behind the trenches. Appreciate you sharing that. So next time you go clicking through your EMR or you’re working on some project just know that Keith is probably one of the guys responsible for the fact that it works and it’s in place right now. That’s wonderful Keith. So getting close to the end of the interview here and I think we’re gonna have to do a part two because this was fun it was educational. This is a part of the podcast where we go through a lightning round, someone ask you five questions. This is all about the one on one of Keith Boone. What it takes to be effective in healthcare IT So I’ve got five questions okay. Saul Marquez: Lightning round. What’s the best way to improve healthcare outcomes? Keith Boone: So it’s really pretty simple. You have to focus actually on the outcome you want to impact. So when you’re measuring quality, you have things about structure, things about your process, and things about your outcome. Structure and process lead to outcomes but they aren’t the outcome themself and you can game structure and process but you can’t game the outcome. So focus on the outcome. Saul Marquez: Love that man. What’s the biggest mistake or pitfall to avoid? Keith Boone: So we often have what we call a solution in search of a problem. That’s the thing you want to avoid. Don’t think you’ve got a great solution. Then go look for the problem. Look for the problems and then come up with solutions for the problems. And that’s what’s going to get the most value to the consumer. Keith Boone: Two ways. One, I personally participate technology advancements routinely several times a week and then I make sure to engage the people in my organization in those activities directly and make sure that they’re focused, they’re paying attention to them, and then bring that material back into the organization. Make sure you’ve got somebody who’s actually focused out front and then bringing that back. Saul Marquez: That’s great. What’s the one area of focus that drives everything in your organization? Keith Boone: I would have to say making sure we deliver value. In everything we do, we have to be looking to the future but the future is like three years from now. And what I have to deliver to my customer is 3, 6, 9, 12 months from now. So focusing on how I can plan for the future and yet still bring value today not build the greatest latest and greatest widget whatever but making somebody wait three years for it to actually show up and they’d be the wrong thing. Saul Marquez: Powerful. Well what would you say your number one success habit is? Keith Boone: My number one success habit. I’m curious. I spend a lot of time reading stuff that doesn’t necessarily seem relevant to what I’m doing at the time. And then somewhere along the way some stupid fact that I knew or some silly little thing that I read or some two pieces of something fit together in a remarkable way and that enables me to do things that other people can’t because I’ve managed to put two and two together and come up with five. Saul Marquez: Love that. How do you recall this stuff? Are you a, do you have a photographic memory, the journal? Keith Boone: So I do write down a lot of stuff. I find that the act of writing is something that makes it possible for me to remember things. Keith Boone: But more importantly I know how to look things up. Keith Boone: No not just after I write them I know “Oh yeah. I wrote about oh there was some book somewhere. Oh let’s see what was that.” It turns out it was how physicians think where I was reading a particular story about a patient who had as it turned out celiac disease. But the whole book itself was sort of just ways that people think and I didn’t remember the title of the book. I couldn’t remember that it was written by Malcolm Gladwell. But I knew how to get to the information because I remember I bought at the same time I bought blank. Keith Boone: And it was a two for one deal on Amazon and sure enough they were selling them side by side still. Keith Boone: So just being able to figure out how to access the information. The information is there, you just have to be really really tenacious to go look for it. And often it will eventually pop up. And then you can use it. Keith Boone: Why I started a blog. Because my blog accessible via Google. Saul Marquez: That’s another way to do it. I love it man. And it’s recalling these things and there’s this quote by Ralph Waldo Emerson says every scholar, every genius out there doesn’t matter who they were. There was one point where they picked up a book, read it, were enlightened, went forward, and just totally forgot where and what they read and they never got that idea back again. And that’s why it’s important for you to write things and be able to recall them and you seem to do both so kudos to you Keith. Love that you shared that with us. So what book would you recommend to the listeners? Keith Boone: How Physicians Think. That’s why I was looking it up because you asked the question what book what I recommend. And I thought well what was the book that had the biggest impact on me in understanding what healthcare software needs to be able to do. And so how physicians think talks a lot about what physicians go through in terms of the diagnostic process and you know interestingly enough I spent 20 years in software and I had a three year diversion in hardware. You become a really good diagnostician when you’re working with computers because you always have to figure out why isn’t it doing what it’s supposed to be doing. Keith Boone: What that book helped me to learn was how that cognitive process that physicians go through is very much like similar cognitive processes that other people who work with very complex things go through and that it wasn’t magical in terms of how they operated. I could actually take what they did and map it to the kinds of things I do when I’m trying to figure out a problem and the kinds of tools that I use. And that gave me an excellent way to make their world a little bit more understandable to me so that I could produce things that would be a little bit more useful to them because if I could map it back to how I did, what I was doing, then I could design solutions that I would know would work for me. That would also work for them. They’re humans. Keith Boone: And How Physicians Think is Jerome Groopman. Saul Marquez: Jerome, what was the last name? Saul Marquez: There you have it guys and gals. Jerome Groopman, How Physicians Think, outcomesrocket.health just type it in there and look up Keith Boone it’s Keith Boone, type him in a search bar you’ll see a copy of the transcript of the syllabus we put together for you as well as a link to his work, his blog, and also this book that he just recommended. Keith, this has been a pleasure my friend. I love if you could just share a closing thought and then the best place for the listeners could follow you or get in touch. Keith Boone: Okay. So closing thought, we are sort of reaching that point with technology where it is making our lives better. I know that a lot of physicians think “oh this is, this is such a burden.” And understandably it is challenging to have to learn new things at the same time think about the way that healthcare was 50 years ago and where we’re at. What we can do today. It really as it turns out is a lot better. And then the second part of your question you can find me at motorcycleguy.blogspot.com. And there’s a whole story behind that as well. It’s on the very first post that explains why my blog is called motorcycle guy. Saul Marquez: I love it. I’m going to read it. Keith Boone: And you can also find me on Twitter at @motorcycle_guy. Saul Marquez: There’s the motorcycle theme again. Keith Boone: Yep. You know I needed a Twitter handle to go with the blog. It turned into a personal brand back before I knew anything about personal branding. Keith Boone: But it fit, Saul. Saul Marquez: That’s cool. That’s cool. So folks there you have it. Great discussion with the Keith Boone, delivering value, being curious, make sure you’re able to appreciate how managing health care data has changed today. I really loved our conversation Keith and excited to share it with listeners. Thanks again for spending time with us. Keith Boone: All right, thank you. The above audio transcript of “Exploring Health Interoperability and API’s with Keith Boone, Informatics Adept at Audacious Inquiry, LLC” was transcribed by the best audio transcription service called Sonix. If you have to convert audio to text in 2019, then you should try Sonix. Transcribing audio files is painful. Sonix makes it fast, easy, and affordable. I love using Sonix to transcribe my audio files.